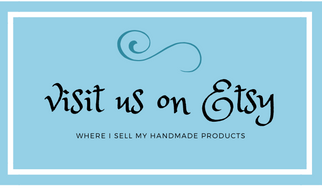 I am joining up with Diana of The Girl Creative and 30 other bloggers to bring you a wonderful collection of handmade Christmas Ornaments today. Just in time for you to be able to make a few before you put your tree up this year. Below you will find my contribution to this collection along with the tutorial to make it. 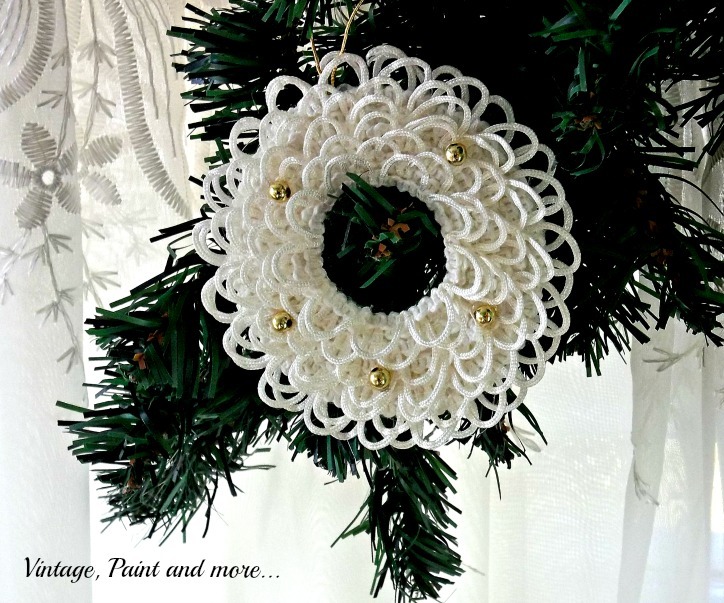 This cute little ornament can be made with any kind of lace, ribbon, rick rack and embellishments but, let me tell you the story behind this particular choice I made for this ornament. My sister owns a fabric shop and somehow she inherited a ton of buttonhole looping. 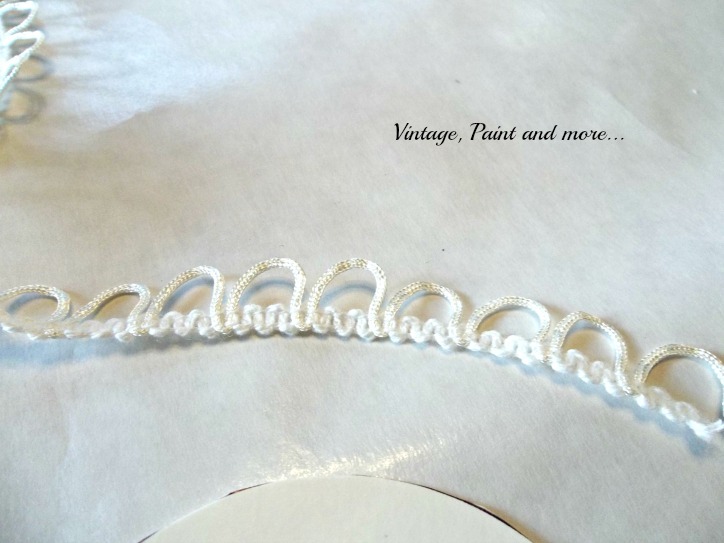 This is the looping you use for those vintage dresses that have a million buttons down the back or down the sleeve. They were very popular in the 70's if I recall. Well, she challenged me to come up with some ideas for using this since those type of dresses are no longer vogue. 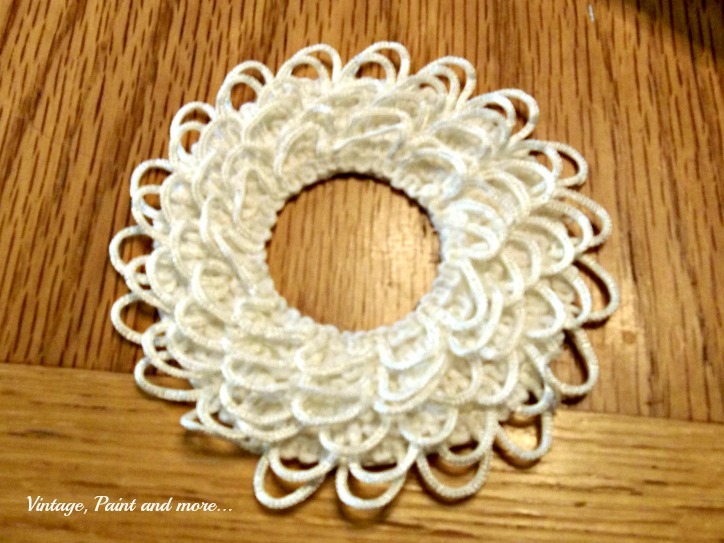 Among some of my ideas is this little Christmas wreath. It is a very simple project that takes very little time and can be used in many different ways. So let's get started. 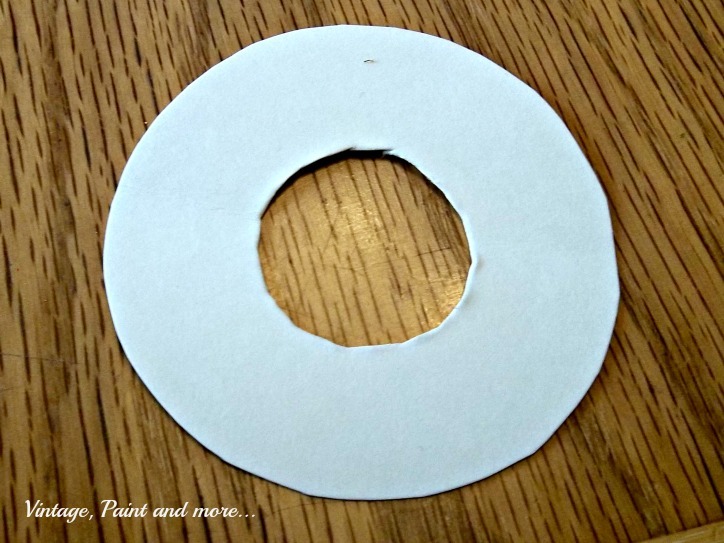 Your object to make your circle - one for the outside and one for the inside circle. 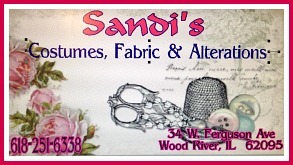 Your lace, buttonholing, ribbon or rick rack. 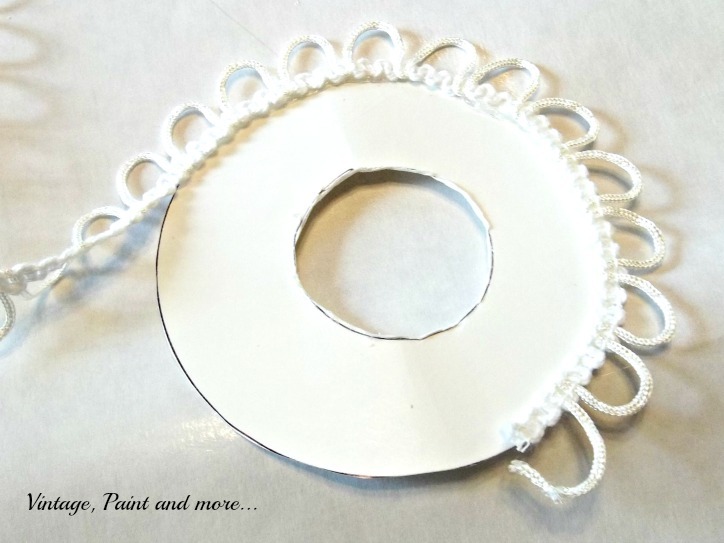 The next step is to start gluing the buttonholing or your trim choice onto the poster board circle using hot glue. I started on the edge of the circle and then just continued going around the circle keeping the flat edges touching as I went around. This created a layered full look. When I reached the center. I just cut the buttonholing, folded back a little edge and glued it down to make a nice neat ending. I then glued little gold beads around it - you can use any color or style of bead or embellishment you like. And then used some gold thread to glue a loop onto the back to hang it with. That's all there is to this little project. So simple and quick. I was able to make several one evening while watching TV. My kind of project. 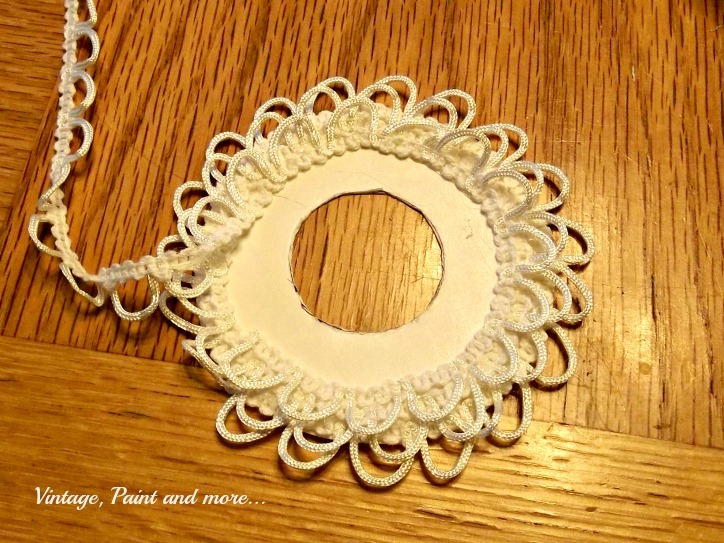 And so adaptable to your own decor by changing out the type of trim and/or the embellishment you use. I hope you enjoy perusing all the creativeness and great inspiration found in this collection and take the time to visit some of the blogs. I will be linking up to the parties listed on the I Party At page above. Please go and visit them I am sure you will find some great projects and inspiration. 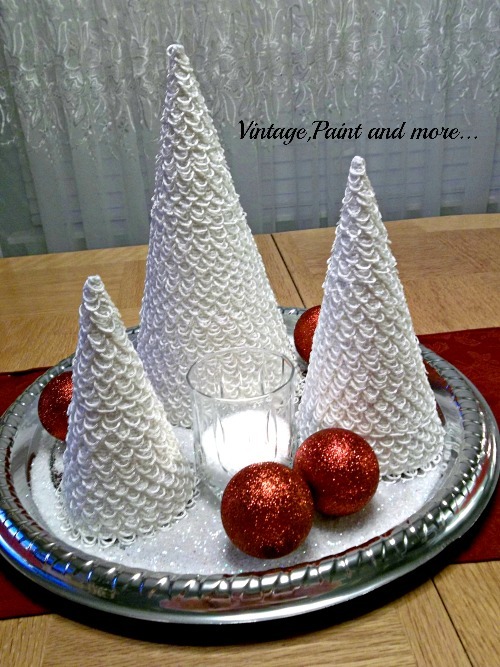 Wow that looks easy and oh how beautiful the ornaments is. Cathy these are just adorable!!! This ornament is simply stunning! Thank so much for sharing your tutorial! Oh my gosh, I love BOTH the ornament and the trees! You are so creative! I have fond memories of button holes like this, they're on my mother's wedding dress from 1945 that I wore for my own wedding in 1995. Pretty, but what a pain to actually button lol. I'm off to see some of the other ornaments! So many amazing ornaments, they are beautiful. Thanks for sharing. When I first saw these, I thought you had crocheted them, and I can't crochet. I'm so glad to know that they're much easier to make than I thought. :) Beautiful! These are just lovely. I love how the white pops off the green of the tree. Beautiful! These are so pretty Cathy...and oh my gosh those trees are stunning! Have a lovely day. LOVE LOVE LOVE these !!! Now I want those and Tammy's and that's it - just the two of those all over my tree ! Really beautiful Cathy! Love the trees you made with that stitch as well. Great roundup! Thanks for sharing with SYC. 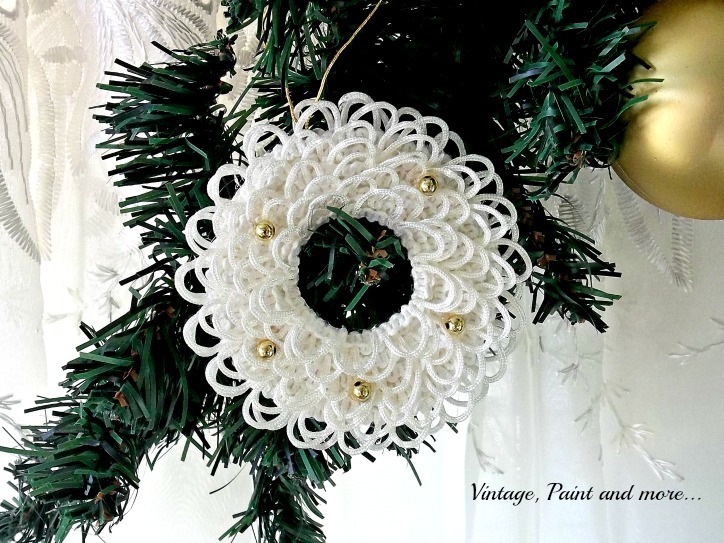 Those trees are just too pretty and combined with your little wreath, they make such a great use of buttonhole looping! I'll have to keep my eye out for it. Thank you for sharing this with us at the Thank Goodness It's Thursday party, Cathy! See you later this week.